Roma graduated from the University of Saskatchewan where she obtained Bachelor degrees in Education, Kinesiology and Physiotherapy. Her work as a Physiotherapist has been diverse incorporating both the public and private sectors. During Roma’s 18 year career, she has gained extensive experience treating trauma-induced sports injuries, repetitive strains, motor vehicle accidents, work-related injuries and in post-surgical rehabilitation. She has recently returned to Calgary after an opportunity to work in the Cayman Islands for the past two years. 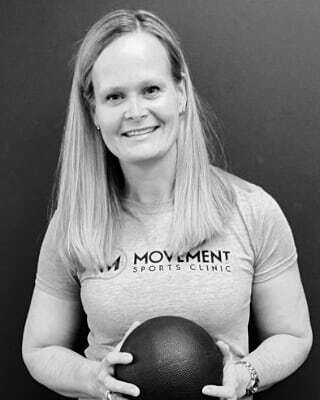 Her passion for treating sports related injuries drew her to work with the team at Movement Sports Clinic. Roma’s patients appreciate her thorough and personable care. Her approach to rehabilitation is to educate patients about their injuries, advise them on what they can do to facilitate their healing and apply the optimal Physiotherapy treatment. In an effort to continuously expand her skill set as a Physiotherapist, Roma has pursued courses in manual therapy, Gunn IMS and spinal stabilization. This year she is studying diagnostic imaging for Physiotherapists and is looking forward to being able to provide this specialized service for her patients. Roma’s passion for treating sports injuries stems from her own experience as an athlete. While at the University of Saskatchewan, she was a member of the Huskie Track & Field Team and competed nationally and internationally in the Heptathlon. While competing at an elite level, she gained an appreciation for the positive influence that Physiotherapy had on healing injuries and optimizing athletic performance. Since hanging up her track spikes, she has found a new passion in the sport of rowing and is a member of the competitive program at the Calgary Rowing Club. Roma identifies with patient’s athletic goals and understands what motivates them. She is committed to providing Physiotherapy treatments that help her patients get back in the game!